APPLE, CORE BLIMEY (Malus domestica Core Blimey). Fruit. 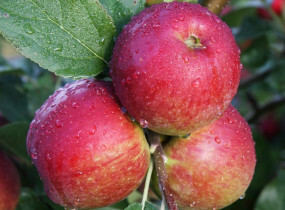 A modern variety producing wonderfully aromatic, highly flavoured, juicy, crisp, rosy red apples of Cox type but easy to grow. Suitable for growing nearly anywhere in the United Kingdom in a sunny position where it will be disease resistant. It was developed in 2008 for the charity promoting urban fruit production, The London Urban Orchard Project, hence its fun Cockney name.